Merck’s recent announcement that its infliximab biosimilar, Renflexis, was awarded a U.S. Department of Veterans Affairs (VA) national contract has sparked curiosity about the potential influence this might have on biosimilar adoption and formulary preference in the rest of the market. Renflexis was determined to be the lowest-priced infliximab proposed under a competitive solicitation and, as such, was awarded preferred use as the only infliximab option listed on the VA National Formulary (VANF). It is important to note that while infliximab is the preferred agent for new starts, the VA is not forcing conversion of patients already on therapy without provider approval. The VA will also continue to cover other infliximab products after appropriate approvals are obtained. In order to understand the importance of this recent development, it’s necessary to understand how the VA formulary is constructed and how coverage decisions are made. Similar to most commercial payers, the VA Pharmacy Benefits Management (PBM) will conduct a clinical review of the product to determine if it should be made available to their beneficiaries. In the VA, prescription copay is defined by regulation and is not tied to formulary status. The prescription co-pay structure of the VANF consists of preferred generic, generic, and brand. A biosimilar selected for preferred use may be subject to the VA prescription branded copay, or the preferred generic copay when an approved contracting strategy is in place as per 38 CFR Part 17. Though many manufacturers strive to be placed on the VA formulary, it is also important for many specialty drugs that there is appropriate clinical guidance for prescribing, known in the VA as a “criteria for use” (CFU). The CFU, which is established by the VA’s PBM, lays out the pathways for utilization. The VA PBM independently establishes CFU’s when there is a need to guide safe and effective use of a product. For example, the CFU for a specialty product will sometimes specify which specialists are permitted to prescribe that therapy. In addition, there can be anywhere from one to two or as many as five to seven criteria in a drug’s CFU. Specialty drugs, generally considered high-cost, high-complexity, or high-touch therapies, will typically have a VA CFU established to guide utilization. This is often the case for both specialty products on-formulary and those that are not, and must be followed before a specialty product can be dispensed. The VANF is the sole drug formulary used in the VA; however, if a national CFU is not established, local VA medical centers (VAMCs) or regional Veterans Integrated Service Network (VISN)-level CFUs may be developed for non-formulary drugs. While Renflexis is the first formally covered biosimilar on the VANF, two other biosimilars have established CFUs in place. As we start to consider biosimilar adoption in the VA, it is important to understand the context for access and reimbursement in this health system. With that, reasonable assumptions can be made about the extent of influence the VA’s first-line utilization of biosimilars may have on the rest of the payer market. By law, the VA has statutorily mandated access to favorable drug pricing. 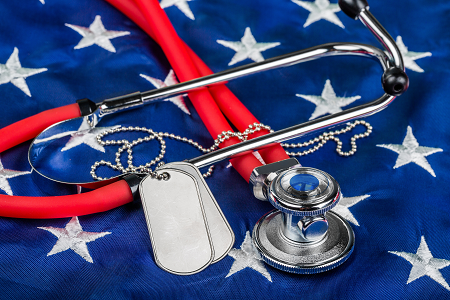 Unlike the Department of Defense healthcare system, where two-thirds of care is provided in the community physician setting, the majority of VA care is provided within its own integrated system. The VA operates over 150 VA medical centers (VAMCs) and 1,200 VA community outpatient clinics. Office and hospital administered products are ordered from the VAMC pharmacy for administration that qualify as “covered drugs” are subject to statutory pricing mandated by Public Law 102-585. A covered drug, in general, is an FDA-approved prescription drug marked under an NDA, a supplemental NDA or BLA (as well as authorized generics and biosimilars). These products are subject to the statutory pricing requirement for the life of the product, even after loss of exclusivity. The covered drug statutory discount is 24% off the Non-Federal Average Manufacturer Price (NFAMP). Unlike Medicaid’s AMP which is based on all manner of discounts, NFAMP is based on discounts to direct purchasers (largely wholesalers) and generally equates to a minimum of 26% off WAC (with 2% prompt pay is considered). It is also important to note that the limited three-tier structure of the VA prescription co-pay designation does not provide a specialty tier for high-cost drugs. Veterans are not subject to large co-pay fluctuations based on the formulary tier of the drug, nor are they subject to cost sharing. Instead, veterans are classified into one of eight priority groups by a disability rating, with no copay for those in priority group one and nominal copays for all others (maximum branded product copay is $11). While the VA enjoys favorable pricing not seen elsewhere in the market for any biologic administered in the integrated channel of care to its beneficiaries, it must absorb all of the remaining costs. Therefore, it is desperately trying to get a handle on the unique challenges that exist with regard to specialty drug prescribing and utilization. The VA remains challenged in providing a high volume of care on restricted congressionally-designated budgets. The VA benefit operates only as a primary payer, meaning an enrollee must choose to either bill the VA benefit or their private insurance/Medicare Part D benefits for a claim. The VA does not operate as a secondary payer to other insurers, but may seek cost-share from those plans to supplement VA benefit engagement. As such, VA benefit utilization by beneficiaries can be unpredictable. Current statistics reveal the VA benefit is engaged by roughly 64 percent of enrollees on an annual basis, with the remaining enrollees utilizing other sources of care for coverage. All of these factors have led the VA to procure a good deal of specialty physician care from community providers on a part-time basis. For instance, many oncologists treat at various VAMCs one or two days per week. As is the case in the commercial setting, these specialists are given latitude to prescribe according to patient need, regardless of a drugs formulary status. While VA pharmacy chiefs fully vet all non-formulary selections, formulary deviations are supported when they are appropriately documented and determined to be in the best interest of the veteran. The health system understands the cost and burden on the veteran involved in alternative means of care, such as sending a beneficiary to a specialty in a VAMC 50 miles away to see a full-time VA specialist or re-procuring a new part-time community provider. As such, there are a few changes underway. Recent legislation, known as the VA MISSION Act, aims to expand VA community care. This new act will allow enrollees to go into the community for their care regardless of how far away they may live from their VA hospital. (A previous law required a member to live at least 40 miles away from the VA hospital in order to visit a community physician.) The act also lays out the same reimbursement timeline as Medicare Part D for the clinics visited by VA benefit enrollees. Though this act has yet to be fully implemented, it poses some benefits for the treatments that are preferred on the VA formulary. For instance, as more VA enrollees venture into the community for their care, it’s expected we’ll see an increase in use of the VA benefits because there is no cost-sharing for specialty drugs (and minimal co-pay depending on a veteran’s disability rating). In turn, the more VA enrollees being treated in the community using their VA benefits will bolster the formulary’s influence in the community setting. Though, in the past, specialists hired by the VA had more leeway to prescribe their preferred therapies regardless of VA formulary status, opening up the physician network more widely will provide greater access to physicians that will abide by that formulary. However, this transition to the VA formulary will be a steep learning curve for community physicians. As such, this is expected to further complicate VA formulary control, and the cost involved in adjudicating non-formulary requests from community physicians may take a toll on the operational limitations of the health system. Biosimilar developers have made it clear that highly integrated systems like the VA are key targets for fast adoption of biosimilars. These closed systems acting as both the insurer and provider are expected to embrace biosimilars as first-line therapies and set the tone for the rest of the payer market. In theory, this quick adoption may represent a significant and easily accessible savings opportunity. The VA in particular seeks to better control the use of specialty products due to the unique complications noted above. The VA is often cited as a model for the Center for Medicare and Medicaid Services (CMS), and preferred use is often leveraged for promotion, as seen with the widespread Merck announcements regarding the VA’s first-line designation of Renflexis. At minimum, specialty physicians treating VA patients will have exposure to preferred biosimilars and potentially develop a greater level of comfort with biosimilar utilization. These specialty physicians are often key opinion leaders in the community setting and stand to potentially provide widespread spillover with regard to prescribing habits. Commercial payers, particularly other integrated networks, will be watching and waiting, allowing the VA to take on the initial opportunity before implementing their own first-line use of biosimilars. Cheryl Nagowski is senior director of federal markets at D2 Consulting. She has a diverse life sciences background, ranging from commercial managed care formulary bidding to state to federal government contracting. As a former government contracting officer, her background includes successfully negotiating both for and with the federal government. Currently, she is responsible for leading federal market access and reimbursement activities for pharmaceutical, biopharmaceutical, and durable medical equipment manufacturers. Her specialties include advising on drug launch, market access, supplemental contracting strategy development and negotiation, Federal Supply Schedule management, and a wide range of compliance and regulatory concerns.